October 24, 2016, has been established by Rotary International as the 4th Annual World Polio Day. The 2016 event will be high-lighted by a live-stream World Polio Day program originating at the U.S. Centers for Disease Control and Prevention (CDC) headquarters in Atlanta, Georgia. Its intent is to help keep focus on the global efforts underway to completely eliminate the crippling polio disease. Rotary International, a global organization comprised of nearly 34,000 clubs across the world, including local Rotary Clubs of Mineola, Quitman, Hawkins/Holly Lake, Winnsboro, and Big Sandy, made polio eradication its top priority in 1985. 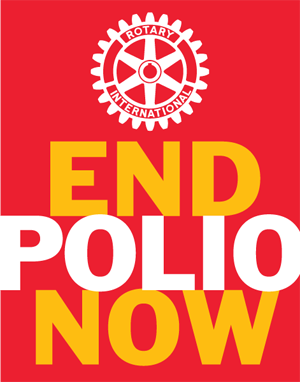 Since then, Rotary has contributed more than $1.5 billion to polio eradication efforts. When the initiative started, more than 350,000 people were stricken by polio every year with nearly 1,000 new polio cases every day. Since that time, largely due to the funding support of Rotary International and the “Bill and Melinda Gates Foundation”, wild polio virus cases have been reduced by 99.9% with only 27 cases reported so far in 2016. Only two countries, Pakistan and Afghanistan, have been unable to completely control the paralyzing disease. If health workers can root the wild polio virus out of these two last strongholds, polio is poised to be only the second human disease ever eradicated, after smallpox. Experts hope to see the last case of polio in these countries in 2016 or 2017, bringing this opportunity tantalizingly close. However, experts also believe that an additional $1.5 billion will be needed to complete the effort. In order to help do their part, the areas Rotary Clubs have undertaken various fund-raising efforts designated specifically to contribute to Rotary’s Polio Plus “End Polio Now” campaign. For example, the Quitman club designated all its profits for Polio Plus from its food booth sales at the last Old Settler’s Reunion. Additionally, every member present at Quitman’s October 20 meeting contributed $26.50 each towards the campaign (see the attached photo). Altogether in 2016, Quitman Rotary, has donated over $1100 to the Polio Plus effort. For more information about World Polio Day and “End Polio Now”, visit www.endpolio.org.